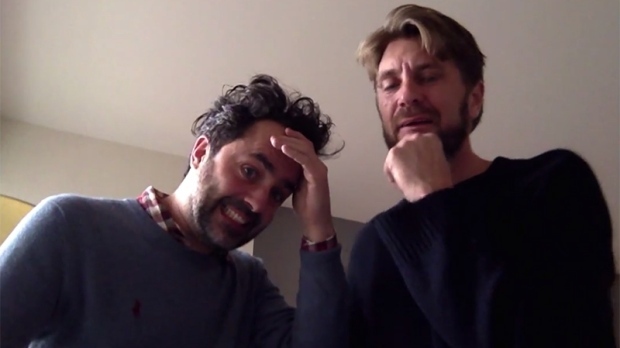 This image taken from YouTube shows "Force Majeure" director Ruben Ostlund and producer Erik Hemmendorff reacting as the Oscar nominations for Best Foreign Language Film are announced. A Swedish director whose film "Force Majeure" was snubbed for an Oscar nomination reacted in disbelief by wailing and... apparently taking off his clothes. Director Ruben Ostlund and producer Erik Hemmendorff recorded their reactions as the nominations were announced Thursday. The pair nervously ate apples in their New York City hotel room and joked tersely as they awaited the Best Foreign Language Film category. Ostlund repeatedly fixed his mop of unruly hair while the two waited anxiously. 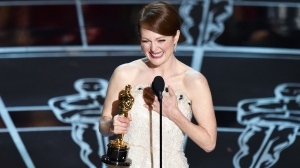 As the nominated films were read out live on television the two traced an emotional arc from glee and excitement to nervous tension, then disbelief: First "Ida" from Poland was nominated, then "Leviathan" from Russia, followed by "Tangerines" from Estonia, "Timbuktu," from Mauritania and finally "Wild Tales" from Argentina. "Force Majeure" did not receive a nomination. "We're dead," Ostlund says before laughing and embracing Hemmendorff. His phone begins ringing immediately, but goes unanswered. Then Ostlund appears to break down. He begins swearing, then moves off camera and sobs become audible. Then the audio takes a bizarre turn. "Are you ok?... Ruben?" Hemmendorff asks. "Breath. Hey it's cool. Breath." "No, no. Don't undress. Don't undress." Finally a loud, painful wail is heard before the footage stops. It's unclear whether the reaction was genuine or faked. Some have pointed out that Ostlund's film features a main character with a penchant for throwing tantrums. It will be up to Ostlund or Hemmendorff to reveal whether the spectacle was an Oscar-worthy performance, a marketing tactic, or brutal reality.